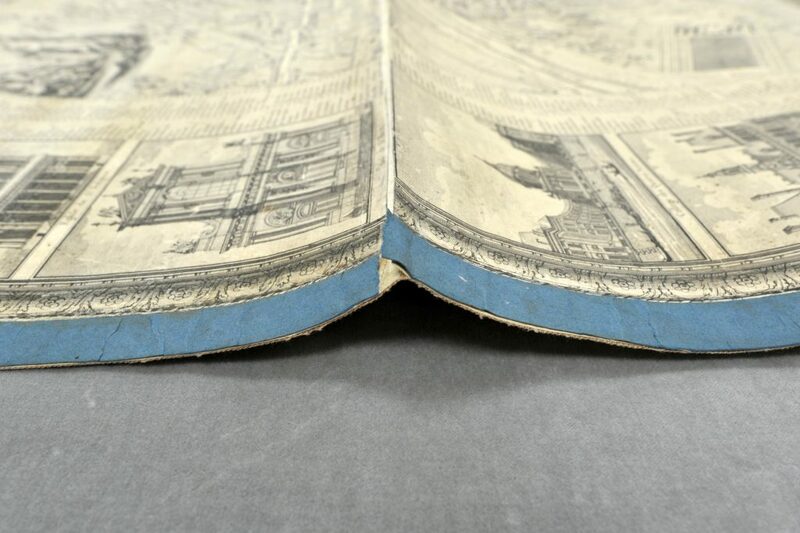 Many paper items in library collections are simply too large to be stored flat. If an item is larger than any available flat filing cabinets, it can be rolled and housed in an archival box. Rolling paper items does have its drawbacks, though. Over time, the cellulose fibers settle into whatever position they are stored in—the tighter the roll, the more difficult the item will be to handle or flatten in the future. Fragile papers pose even more of a risk, as breaking can occur during rolling and unrolling. If a paper object is backed with cloth (as many large maps are), the adhesion between the paper and textile can be at risk. 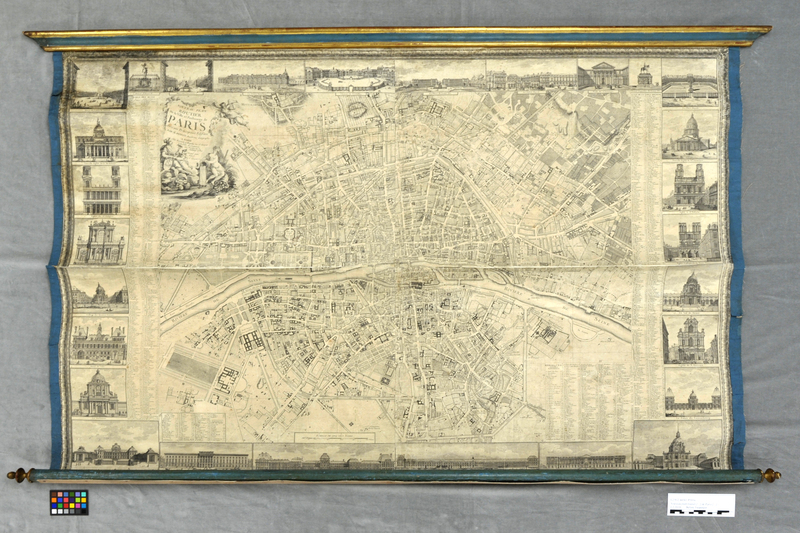 This large map of Paris (M. Pichon, 1782) came down to the lab in January. It was in a mostly stable condition, though there was some delamination occurring between the paper and its canvas backing. In the 18th century, the size of paper was limited to the size of the paper mould used by the vatman at the paper mill. This map, which is 106 cm x 147 cm in total, had to be printed on four separate sheets. At some point during its lifetime, the paper was lined with canvas and mounted onto these glamourous wooden slats—one to serve as roller, the other to serve as hanger. The “peaking” occurring where the separate printed sheets adjoin. 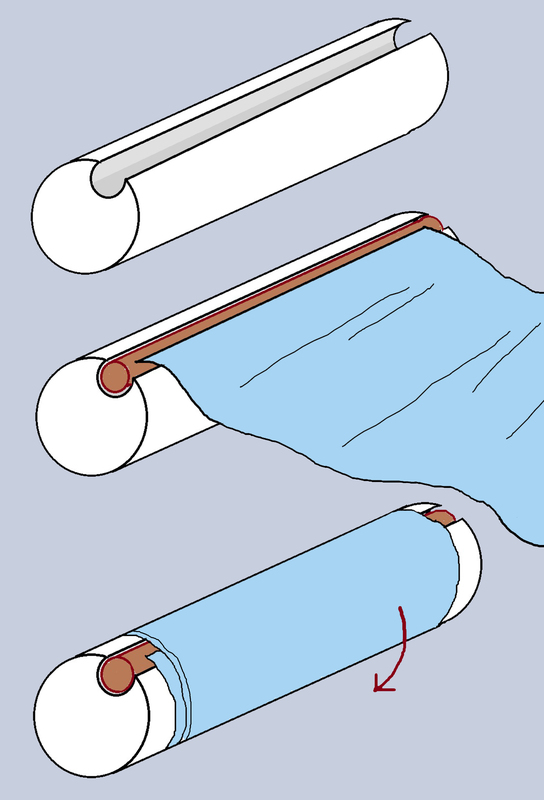 The diameter of the roller is a mere 3 cm; this tight rolling has led to the peaking and delaminating seen at the horizontal joint between the four sheets of paper, which presents a line of weakness. This issue needed treatment before we could house the map. 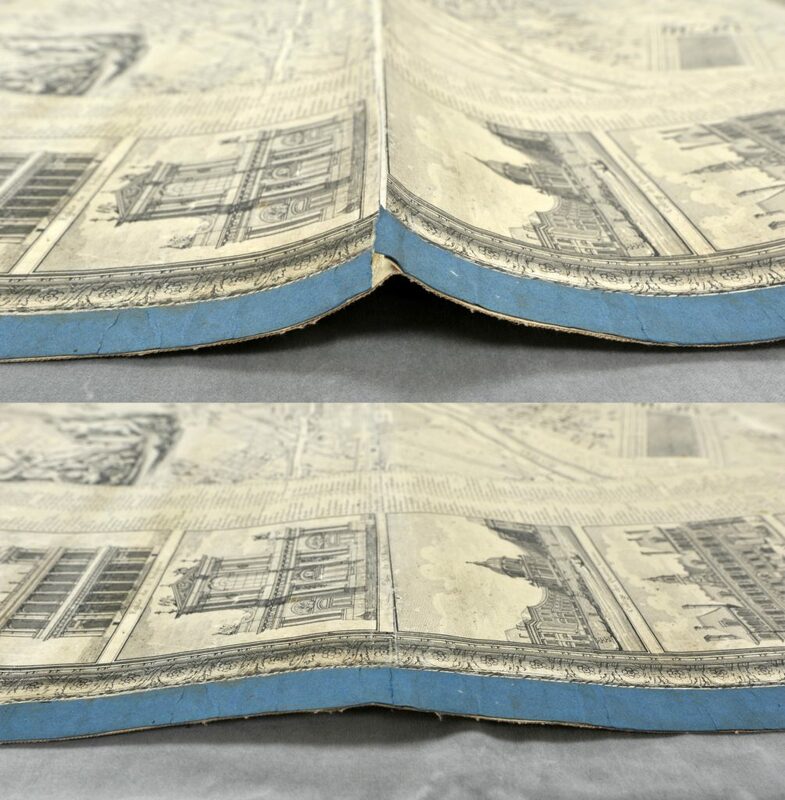 Two narrow strips of heavy Japanese paper, color-matched with acrylic paints, were adhered along the canvas backing following the joint line. This created a strength line to counteract the peaking, and the map settled down flat. The delaminated areas of the map could then be re-adhered to the canvas with wheat starch paste. To expand the rolling shape of the map, we drew inspiration from a Japanese tradition. 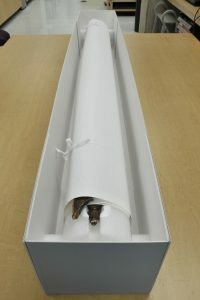 A common way to expand the rolling dimension of Japanese scroll paintings (kakejiku) is the futomaki (the same word used for a large style of sushi roll). Traditionally made of wood, these rollers consist of a wooden cylinder with a cylindrical channel running through one side; the kakejiku roller rests inside of this channel, and the painting rolls around the futomaki at a much larger diameter. 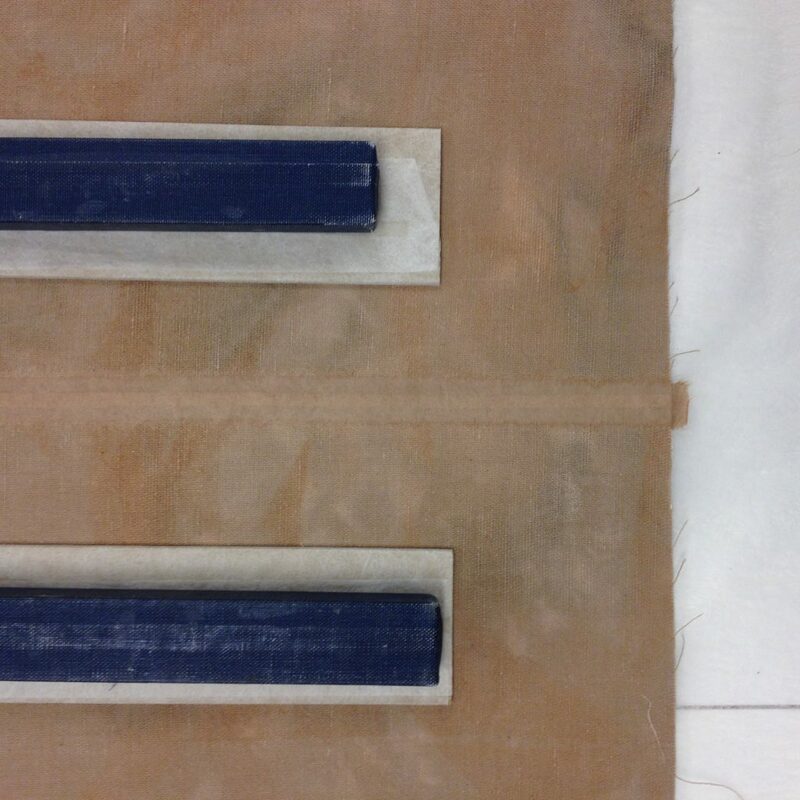 For our French map, we followed the instructions laid out by conservators at the Freer-Sackler Gallery for making futomaki-style rollers out of Ethafoam (a material we use frequently in the lab). Apart from the obvious material difference, the primary structural difference between this style of roller and the true futomaki is that the latter possesses a hinge, allowing the channel to open and release the roller. Our Ethafoam roller would simply have a channel large enough for the French map’s roller to slip in and out. After obtaining an Ethafoam cylinder large enough for the map (70” long, 6” in diameter), we fashioned a homemade loop knife at a slightly larger dimension than the map’s roller. Two parallel cuts were made down the length of the cylinder. The loop knife was then drawn through these cuts, creating a cylindrical path. 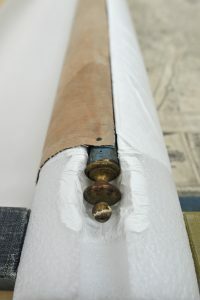 After shaping, the roller was covered in soft-grade Tyvek. A two-piece archival box was retrofitted to suspend the roller so the map wouldn’t rest against the box’s floor. The map was rolled onto the futomaki with alkaline-buffered interleaving paper and tied with twill tape. NOTE: For those planning to recreate this style of housing, Ethafoam distortion should be taken into account. 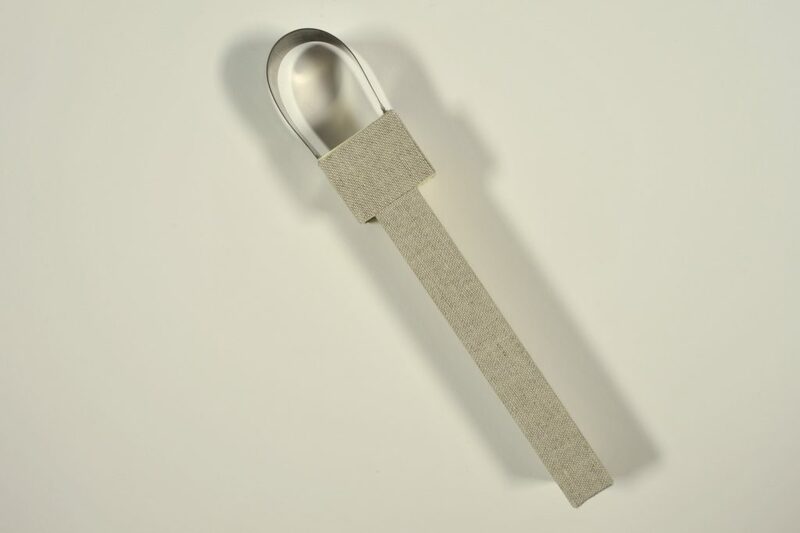 The Ethafoam we purchased for this project, which was sourced from a supplier not previously used by our department, exhibited significant shrinkage upon cutting. After a cut was made in the foam, the newly exposed surfaces would shrink over the course of several days, causing the shape to distort. 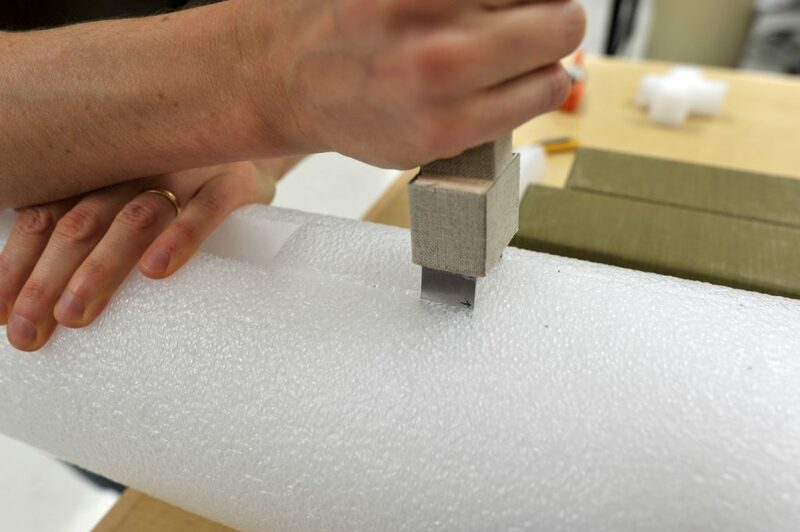 The channel cut for our futomaki had to be re-cut after shrinking.